It is fair to say that, along with the writer, the penciller is the contributor mainly responsible for the creation of the comic strip. The penciller designs the layout of the pages and has a huge influence over the story's pacing. The best pencillers become legends in the business and have readily identifiable styles, even to the most untutored eye. How could one fail to recognise the distinctive style of Jack Kirby or Curt Swan? Later in the Silver Age, brilliant pencillers like Joh Buscema, Howard Chaykin, Neal Adama and Jim Steranko came to prominence, all of them with their own unmistakeable style, even under the most idiosynchratic of inkers. 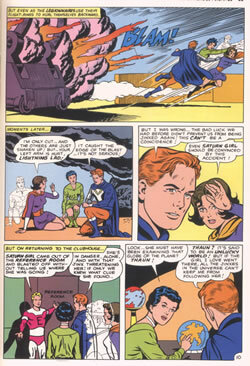 Curt Swan was the mainstay of DC's Superman line of titles during the 1960s. Usually inked by George Klein, his clean style and perfect figure drawing became the look that all other DC artists aspired to. 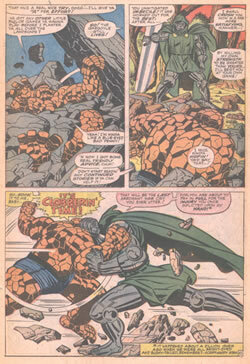 As the Silver Age drew to a close, John Buscema - who would become Kirby's replacement at Marvel - began to define a cleaner, Swan-like look for the Marvel line. 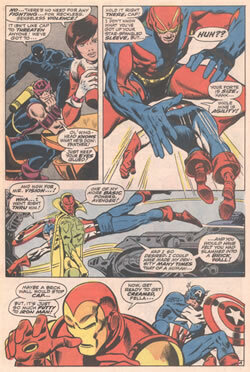 Here, he's at his peak pencilling The Avengers under George Klein's inks.